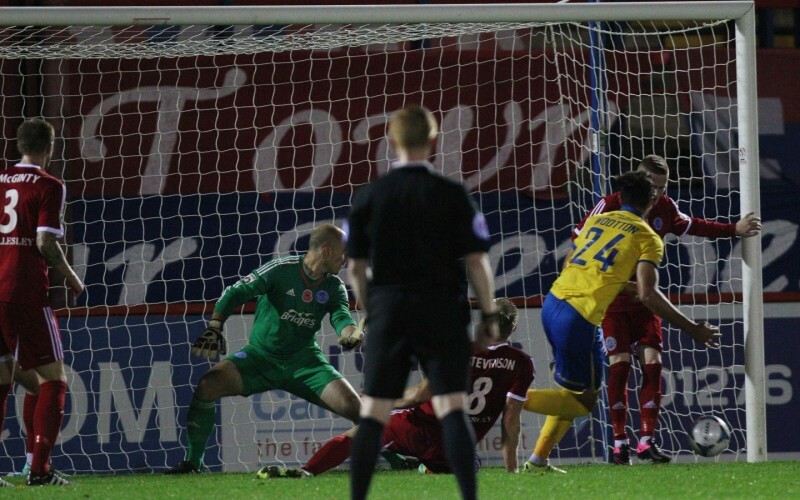 Dipo Akinyemi scores on debut as Aldershot lose to Lincoln. Dipo Akinyemi scored on his debut for Aldershot Town, but it wasn’t enough as they lost 2-1 against Lincoln at the EBB Stadium on Wednesday evening. Kyle Wooton put the Imps ahead in the 38th minute when the ball fell to him inside the penalty area and his effort cannoned in off the far post. Akinyemi, 18, who signed from League Two side Stevenage, equalised for Barry Smith’s side in the 65th minute when he superbly headed Dan Walker’s cross into the far corner. However, the home side’s joy was shortlived, as 15 minutes later, Jack Muldoon’s long-range drive deflected off Jack Saville and left Phil Smith wrong-footed to win it for Lincoln. After going six games unbeaten, confidence was high in the Aldershot dressing room, and that reflected in the sides intensity at the start of the game. Akinyemi, who joins the Shots on a 28-day loan, was given too much space in the seventh minute, but he dragged his 20 yard shot narrowly wide. Four minutes later, the striker turned provider for Dan Walker on the right wing, who burst into the area and his shot was palmed away by Lincoln goalkeeper Aidan Grant. Aldershot continued to create opportunites, but with no reward. Charlie Walker beat Lee Beevers on the right flank before pulling the ball back into the area, but Lincoln’s defence, cleared it back to Walker, but he couldnt control the ball. Slowly but surely the visitors grew back into the game. Muldoon dragged his shot wide before Greg Tempest floated a few crosses over the crossbar, before having a free-kick that was deflected out for a corner. From the resulting corner, Lincoln took the lead. The ball in created chaos in the penalty area and the Aldershot defence couldn’t clear it. It eventually fell to Wooton, who was recalled to the starting line-up after being cup-tied last week, and his snapshot smashed in off the left-hand post to give the Imps the lead. Aldershot had kept five clean sheets in their last eight games, but any chance of picking up a sixth had gone. Smith’s side responded almost immediately. Akinyemi played in Tom Richards who burst into the box from the left wing, but the former Fulham youngster fired over from just six yards out as an even half with Lincoln in front. It was the visitors who had the first chance four minutes into the second half. Craig Stanley, who made 58 appearances for Aldershot between 2012 and 2014 had his effort palmed away by Phil Smith after a neat exchange of passes. In the 55th minute, Dan Walker, in his 150th non-league game, took it past three Lincoln defenders with great skill before crossing towards the back post. His cross was met by the head of Jim Stevenson, but the Aldershot midfielder couldn’t keep his effort down. Four minutes later, the end-to-end action continued. Muldoon’s low cross across the face of goal found Wooton, who forced a fine reaction save from Smith to keep the score at 1-0. In the 65th minute, the Shots were level. Dan Walker burst past Stanley on the right wing and crossed it towards the penalty area. Akinyemi rose highest and powered a fine header past Grant to level the scores for his first Aldershot Town goal. Just two minutes later, the goalscorer set up Stevenson, but on his 200th appearance, fired his acrobatic volley narrowly wide. Lincoln responded with chances for Wooton before Muldoon won it for the Imps ten minutes from time. The midfielder’s long-range effort deflected off the feet of Saville leaving Smith with no chance as Chris Moyses’ side held out for a hard-fought win. Things got bad to worse for Aldershot when Saville limped out with a hamstring injury in added time and they will be hoping he will be fit for the trip to Bradford next Wednesday. Aldershot Town: Smith; Alexander, Saville (Hatton 90′), Beckles, McGinty; D.Walker, Stevenson (Oliver 83′), Lathrope, Richards; C.Walker, Akinyemi. Lincoln City: Grant; Beevers, Waterfall, Howe, Tempest; Muldoon (Hawkbridge 88′), Wood, Stanley (Everington 81′), Sparrow; Rhead, Wooton (Hearn 77′).